I know that I haven't been a very good friend/blogger lately and I am sorry. This term has been crazy, as it's been my first time really living on my own, and it's been great! I have taken on a lot though: I am taking five classes, working 11 hours a week, and involved with multiple student campus groups. I haven't figured out how to fit a good blogging/commenting schedule amidst all of that ... YET. I hope to, and I will. I have been reading and doing so much work and not doing some of the things that keep me alive -- crafting, blogging & arting in general. I definitely am realizing how it affects me (I can't get any work done...) and that I need to make some for sure time for these things. It's exciting. Because, I have some great ideas for adore more/cucuco and I can't wait to do them/share them with you. Basically, I am pretty much overwhelming myself for the year, but I have this peace about it. I mean, after I freaked out for the first week, I gave all my worries and cares to God, and it has been freaking FANTASTIC. I have been feeding off of Phillippians 4:13 and Luke 1:37 everyday and God has been supporting me like the cool cat that he is. It's been great. I know that you all are super busy with life and living and having fun and loving, and I want to encourage you to keep it up. You can do it! I know it's easy to get overwhelmed, but it's not definitely not fun. Let me know how you are doing and if I can pray for you. Yeeeyuhh. 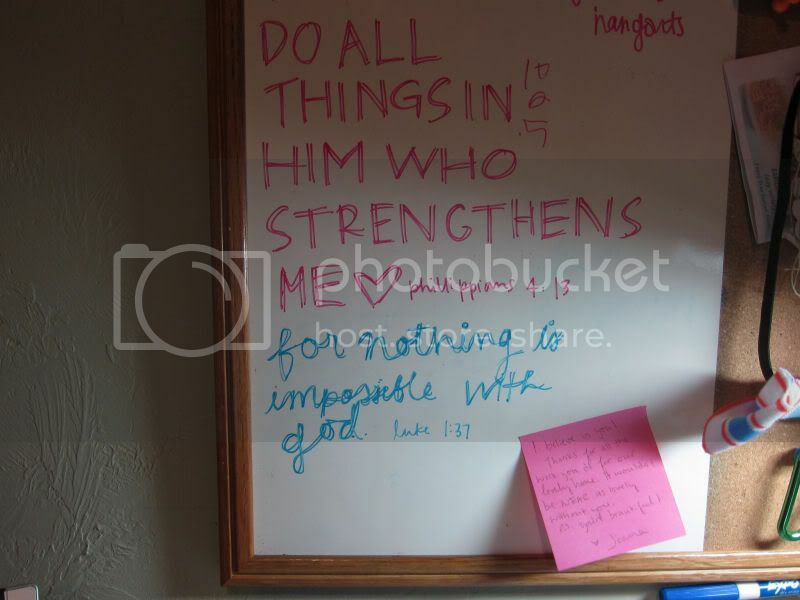 For now, here is a picture of my bulletin board with the verses ....love!